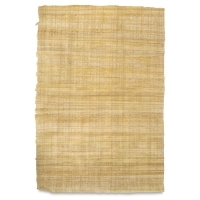 Papyrus is the oldest writing material that is in existence today, dating back at least 5,000 years. In fact, the very word "paper" is derived from its name. 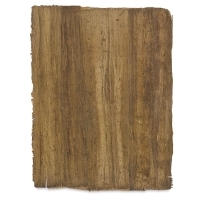 These light-colored sheets are formed by laying thin strips of plant stalk in horizontal and vertical (crosswise) layers. They have better mechanical strength than many modern papers of the same weight. Use them for any kind of writing, drawing, or painting. Paper sizes are approximate, edges may or may not be frayed. Note — Color may vary due to the unique production of this product.